Nowadays, there are many technological advances around us. Dentures are one of them. Medical systems around us are getting advanced and better day by day and scientists and doctors are giving their best to provide their patients the best of best. They put all their energy to devise ways to treat patients and give them back what they have lost. Out of their hard work dentures were introduced which are used to replace the missing teeth of a person. Talking and eating are two most important and beneficial actions of one’s life and without teeth one can’t perform these essential functions. Due to this, patients lack a lot of other things and suffers from many health and mental problems like confidence and various mineral deficiencies results due to lack of nutritious eating. But now due to dentures they can get what they have lost in just 2-3 sittings with their dentist. Now they can not only enjoy the healthy and delicious diet they have been missing for ages but they can smile like before once again. Dentures are a replacement for your lost teeth and so some people feel like they can never be used to the feel of dentures as their missing teeth but now a day’s special dentures have been introduced which give you the feeling of natural teeth and more comfortable than ever. They aren’t fixed there in your mouth and so you can easily take them out when you want and put them back when you like. Dental problems can be very frustrating and missing teeth makes you lack self-confidence so dentures give you back whatever you have lost and have a huge positive impact on your physical as well as psychological health. Fewer visits to the dentist thus less money, energy and time is wasted on this as after getting dentures they are usually easy to tackle and adjust. It takes the same amount of time to clean them as your original teeth thus they require very little maintenance. Now you can once again eat whatever you want. Since after your gums shrivel you may have tooth sensitivity and it can be very annoying and painful sometimes and so it seriously affects the things you eat. Like you can’t eat cold things or hot things either. Due to this reason some people aren’t able to eat comfortably at restaurants but now due to Dentures they don’t have that problem anymore. Its because when teeth are extracted the ligament connecting them to your nervous system is severed. The false teeth are not attached to any nerve thus don’t cause any sensitivity or pain. The Dentures are made exactly according to your teeth size and so you can get the most realistic fit possible and so you can be comfortable in them all you want. Due to teeth less, gums you might start to have wrinkles and sinking of the face downwards or inwards causing you to look older than you are. 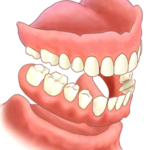 Thus, Dentures fills in the spaces and prevents that happening. Dentures are easy to adjust; you can just visit your dentist and get them fixed according to your choice. Dentures help you look good too as they help you look younger and give you your confidence back. Now you can smile with your mouth open showing all your teeth. Now you can chew food properly and get all the nutrients out of it. Thus, your lifestyle will be back to being healthy once again. Now people won’t have a difficulty understanding what you are saying to them. They are long lasting. With very less maintenance they can last very long like five to ten years. After the removal of the teeth these are made to fit in the mouth in place of the missing teeth after about eighth to twelve months after the gum tissue has been healed. These are the ‘Conventional Complete Dentures while the Immediate Complete Dentures can be fixed in the mouth as soon as the teeth are removed. The advantage of immediate dentures is that the patient doesn’t have to wait for the healing procedure. While a disadvantage of immediate dentures is that during the healing the gums change their shape and so they can only be used until the conventional dentures are made. Protects and keeps other teeth in place. If you or loved ones are suffering from missing teeth and need a replacement badly visit us at Decatur, Georgia for the best available tooth replacement options. Dr Simms is very gentle and honestly cares about the well being of his patients. The staff is young but very friendly. I would recommend this dental office to all. You have to overlook the premises though as they are going about a new face-lift to better benefit their patients. Staff very friendly! Doctor Simms and the rest of the staff make sure you’re comfortable before any procedures are done! I like it at this dentist office the staff is very friendly and I had fun chatting with the staff there. They are informative when you ask a question, and they work with you meaning rather than give you a date, they ask when do YOU want to come in. I would like to thank Dr. Simms for giving me the opportunity of working in the dentistry environment, even though my relationship with the practice was cut short due to the immediately leave from Georgia. I just want to say thank you for being a great leader and boss and keep up the good success. Metro Decatur Dental Group PC is a full service dentist located in Decatur, Georgia inside DeKalb County. Dr. Simms has dedicated his professional life to dentistry, both cosmetic and function. Whether you need basic teeth whitening, cleanings, fillings, or more advanced dentures, root canals, bridges, crowns and veneers, Metro Decatur Dental Group PC is a dentist you can trust. Give us a call or fill out our contact form to setup and book an appointment with our friendly office team.